From the Mr. & Mrs Claus Series dated 1990. 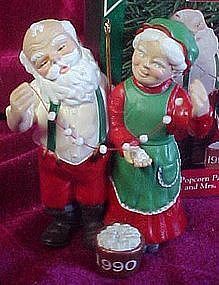 Santa and Mrs. Claus are stringing a popcorn garland in this 1990 Hallmark Keepsake Christmas ornament, the fifth in the Mr. & Mrs. Claus series. Sculpted by Duane Unruh, the ornament originally sold for $13.75. Its estimated secondary market value is $75. Box condition: very good with 1/2 plasic packaging missing, light corner bumps on the box near opening, other minor wear from storage. Ornament is Excellent.